"Donovan Caine wanted me, but he wasn’t strong enough to accept me. Not my past, not my strength, not the woman I was." Great sequel. I really love Gin. After the lost she suffered in the first book, she is picking up the pieces and learning more about herself along the way. 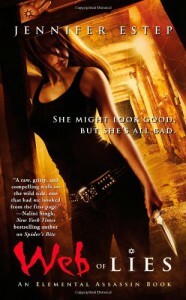 I really enjoyed the fast pace and exciting adventure the "retired" assassin finds herself in. I can only hope Donovan can't actually follow through, but Owen is an interesting new prospect. Can't wait to see what's in store for Gin, Finn, and the gang in Venom.